Wood has been used as a fuel source for transforming soft, malleable clay into a hard, lasting material for thousands of years. It is a heat delivery system with a unique muscularity and presence, with the power to enhance clay objects beyond mere calories. The effects achieved are infinitely subtle and endlessly varying depending on many factors (i.e. clay body, wood source, duration of firing, temperature, atmosphere, etc.) I seek the random yet indelible mark of the fire in my work. Unique wood-fired surfaces that reveal an exposure to intense circumstances, which cannot be achieved any other way. The creative involvement in wood-firing extends far beyond the production of wares. Equally invaluable are the decisions made during the stacking process and firing cycle. Kiln stacking is a three-dimensional puzzle which may be solved in countless ways; each solution determines the quality of ash, flashing, and ultimately, the individual identity of the work. I use a small, non-traditional kiln of an innovative design. It makes use of a ‘Bourry’ style firebox where the wood is stoked via a side door and the flame travels through the kiln by means of a down draft arrangement. The floor of the firebox is stepped with adjustable air openings at each level for maximum control of the ember bed. In the early stages, wood is burned in the form of a small campfire under the firebox. Its gentle heat slowly warms the interior of the kiln and its contents. As the firing progresses, wood is stoked onto grate bars above the coals. This allows the logs to be superheated by the coal bed below and catch fire. As the primary air enters to feed the fire, flame and ash are pulled down over the coals and directly into the chamber. A continuous sifting process occurs during the firing, where the heaviest ash lands on the pieces closest to the firebox, and the lightest particles float to the flue area. This ‘fly ash’ eventually fluxes and melts to form a natural ‘ash glaze’ on the surface of the pieces. There is a visual and tactile vocabulary specific to distinct zones in the kiln. The firebox zone experiences the most intense combustion for the greatest length of time. The sheer physical stress can cause warping or cracking of the forms. This risk comes hand in hand with the possibility of exceptional rewards, as the greatest complexity and depth in ash deposits also occur near the firebox. 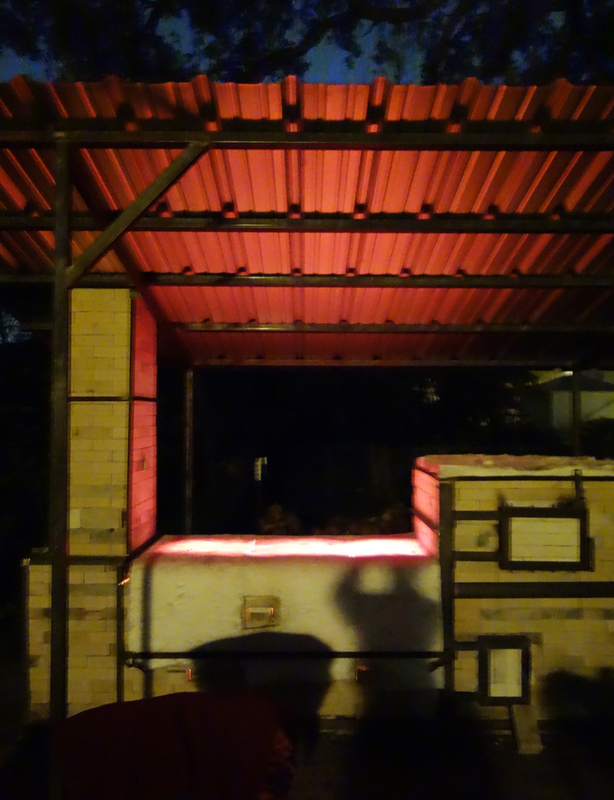 Flashing, a direct reflection of the passage of flame, can be seen throughout the kiln. As we travel towards the back of the kiln, the work reveals more dramatic flashing as well as more delicate ash accumulation. I carefully study the kiln during the firing cycle, reading the flames, tempo, velocity, sound, color, and smell to determine proper response. I make changes to the log size, stoke size and frequency, and the amount of air in and out. There is a partnership with the kiln like that of a musician and his/her instrument. 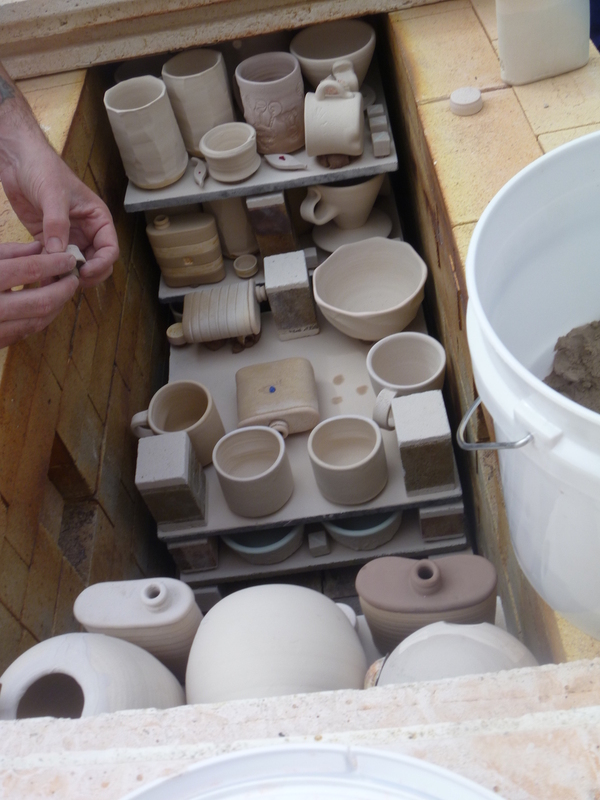 After the firing is complete, the kiln is closed up to allow for a slow cooling process. It is during this waiting period that crystals and color enhancements develop in wood-fired surfaces. Opening the kiln is like Christmas. The work offers a beauty which reveals itself over multiple viewings, divulging new depths each time. Each pot is unique and showcases the chance elements that occur during a wood-firing. I collect pecan and various oaks from my urban neighborhood. Some are green when collected and must be stored for about a year to season. All of the wood is cut to length, then split, organized, and stacked according to size. The labor intensive process of gathering and preparing sufficient amounts of wood for a firing is very satisfying... yet another part of the personal involvement that wood-firing requires.